Resolution-dependent: Images become pixelated when enlarged. 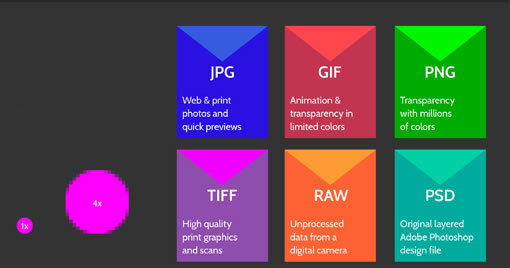 Good for: Photos, digital artwork and web graphics. Resolution independent: Image size can increase without losing resolution. Good for: Logos, icons and type. CMYK is optimized for physical printing. It is a 4-color printing process that stands for Cyan, Magenta, Yellow and Key (black). RGB is optimized for screen viewing. it is a light-based color model that stands for Red, Green and Blue. You can depend on Graphic Expressions to complete your projects within your timeframe and to your specifications. Doing the job right the first time is our specialty!